Haeya has finally done it. 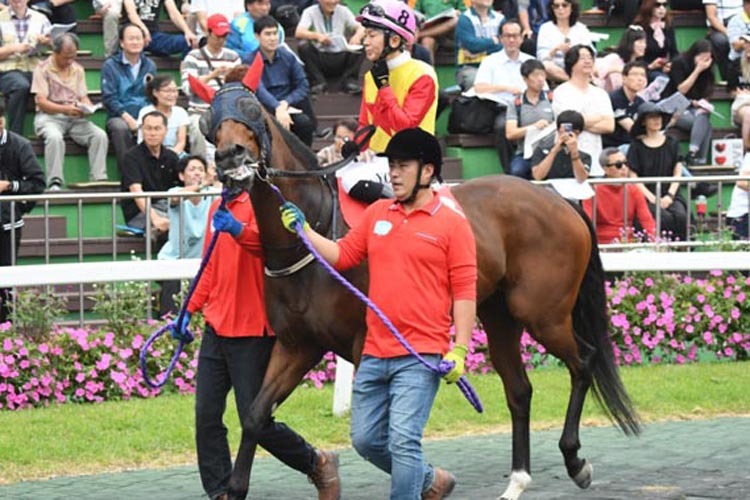 The five-year-old mare whose career has been a litany of injury and other setbacks won the 2nd leg of the Queens’ Tour the KNN Cup at Busan Racecourse on Sunday afternoon to secure her first Group race triumph. Haeya’s distant 3rd behind Silver Wolf in this race last year was only her second try at a mile and also her most recent and while punters sent her off as slight favourite, there was plenty of doubt as to whether she could lead the whole way around – even in the absence of a clear star like Silver Wolf. As it was, Haeya, drawn from gate 1, got to the front as usual but this time didn’t let Cheongsu Yeogeol and Ice Marine flashed home late but couldn’t quite get there and Haeya, coaxed around perfectly by jockey You Hyun Myung, held on by just under a length on the line. After the race, the jockey paid tribute to the owner for persevering with her as getting her to this point had been quite a saga. Imported as a two-year-old in the spring of 2015, Haeya didn’t race until the tail-end of her three-year-old season more a year later but she quickly made an impact, winning her first four races. However, she was never fully sound with the back and pelvis problems that delayed her debut never fully going away. She returned for the Queens’ Tour campaign last year running 2nd to Silver Wolf in the Ttukseom Cup before her KNN Cup 3rd and even had a tilt at the Korea Sprint. That didn’t go especially well but two class 1 handicap wins last October and this January established Haeya as a solid competitor at the top level and was enough for her to be sent off as the odds-on favourite in June’s Ttukseom Cup. She only managed to finish in 8th place though and it looked like her best chance of Group race success could have gone. It emphatically hadn’t. With her runner-up finish to go with her Ttukseom Cup triumph, Cheongsu Yeogeol remains atop the Queens’ Tour standings heading into the final race of the series, the Gyeongnam Governor’s Cup which is also at Busan but won’t be run until November 11th. A lot can happen between now and then although at 1 1⁄4 m, Haeya faces an even sterner test. Cheongsu Yeogeol and Ice Marine, who both finished off very well, will be fancied to go even better then. Haeya [Flatter – Luxaholic (Macho Uno)] has moved on to seven wins from a total of fifteen lifetime starts and now has prize money in excess of 700 Million Korean Won.